Racial segregation is the division of society into groups according to ethnic identity or the color of one’s skin. Segregation can extend into all aspects of public life, including schools, restaurants, and housing. 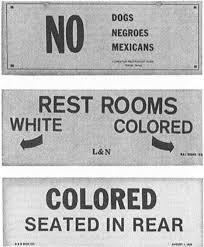 In the United States, segregation was legal in many areas for nearly a century following the Civil War. With the abolition of slavery, many in the South wished to continue their racial dominance over African-Americans. Jim Crow laws mandated strict separation between whites and blacks, including such items as separate drinking fountains, separate schools, and forcing African-Americans to ride in the back of public transportation. These laws were challenged and overturned in the Civil Rights movement of the 1950s and 1960s. However, American society has moved towards a de facto form of racial segregation in that many of its neighborhoods are becoming monocultures. Racial segregation has also existed in many other countries beside the United States. Nazi Germany was obsessed with racial segregation. South Africa under apartheid is perhaps the most notorious example. Strict laws divided South African society into blacks, whites, “Coloured” and “Indian,” affecting where people could live, where they could study, and how freely they could travel. Apartheid ended in 1994 with the election of Nelson Mandela to the presidency of South Africa. Segregation in Schools research papers discuss Jim Crow laws that were legally upheld by the US Supreme Court in the 1896 Plessy v. Ferguson decision. Paper Masters writes custom research papers on Racial Segregation and discuss the division of society according to ethnic identity or the color of one’s skin.